In an effort to begin clearing out some of the extraneous stuff that is hanging around our house and cluttering our cupboards, I collected a box of said stuff for donation. A new thrift store has opened in town so this trip afforded the perfect opportunity to peruse and drop off. Guilt free perfection. The perfect aqua green and in as new condition. Not a stitch out of place, not a mark on the lining. Bliss. 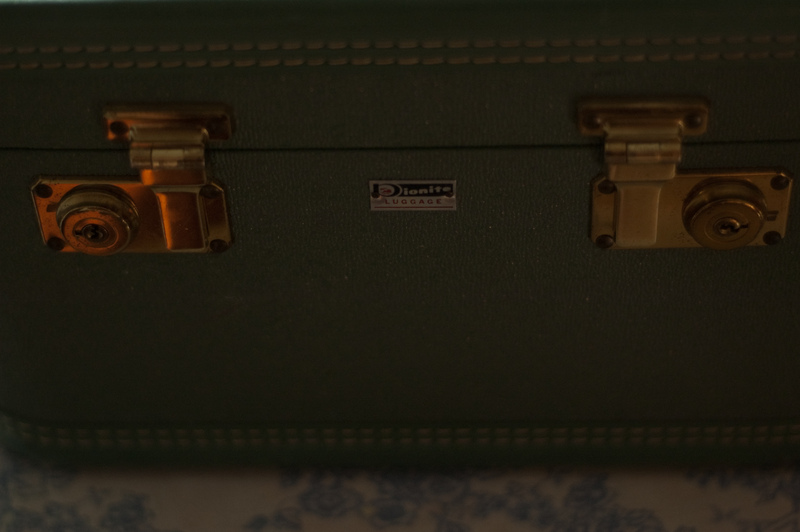 When I was little my Mum had a case like this that held a hairdryer device from the 60’s, my sister and I spent many (many) hours frying our noggins, our heads wrapped in the plastic cap, warm air blowing over our ears. We would stop and swap when the ear burning became too much, but even then reluctantly. When I went to the cash desk the young woman asked me if this was a sewing case. I explained to her that it is a vanity bag, a travel case that a woman would take with her on holiday or a night away, it would hold cosmetics, shampoo, a hair dryer; everything she would need to be presentable whilst abroad. I tried to ignore the strong feeling I had of being about 190 years old as the young woman listened to my explanation with some interest but no comprehension. “That’s a lot of cosmetics!” she said, I smiled and took my case away, clutching it lovingly. 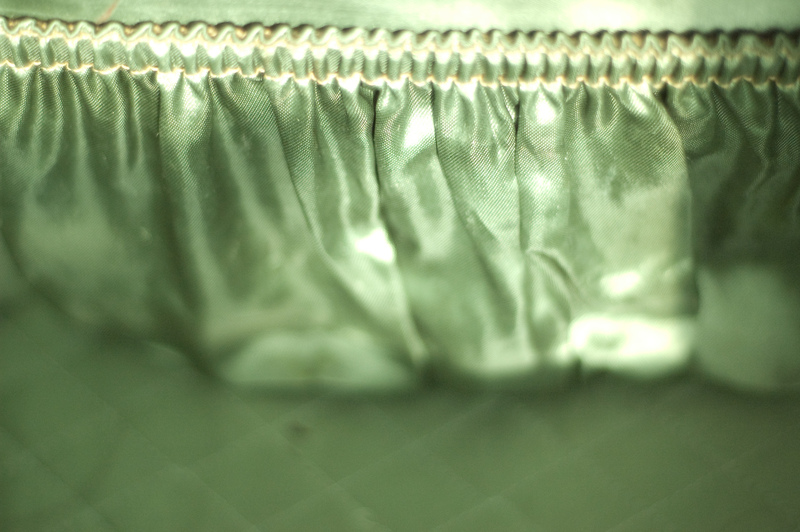 The satin fabric inside reminds me of the curtain in a theatre, shiny and glamourous. 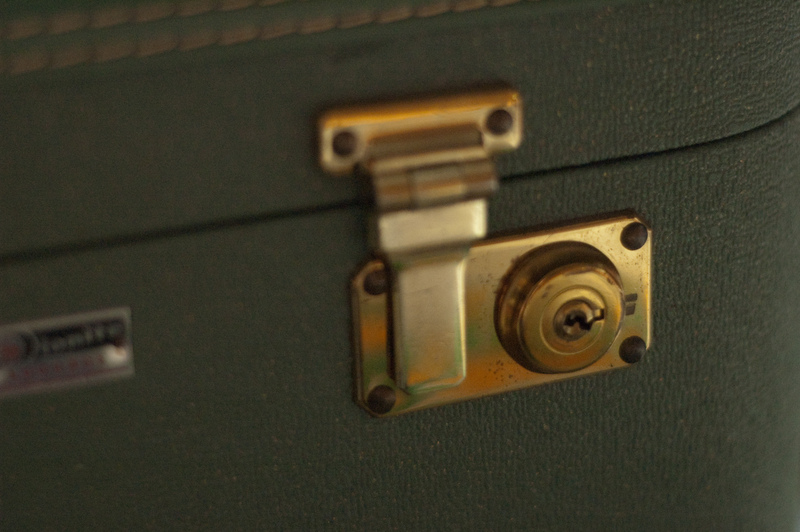 This case is from a time when going away was A Big Deal, travel was not simple or easy and the province of the few. 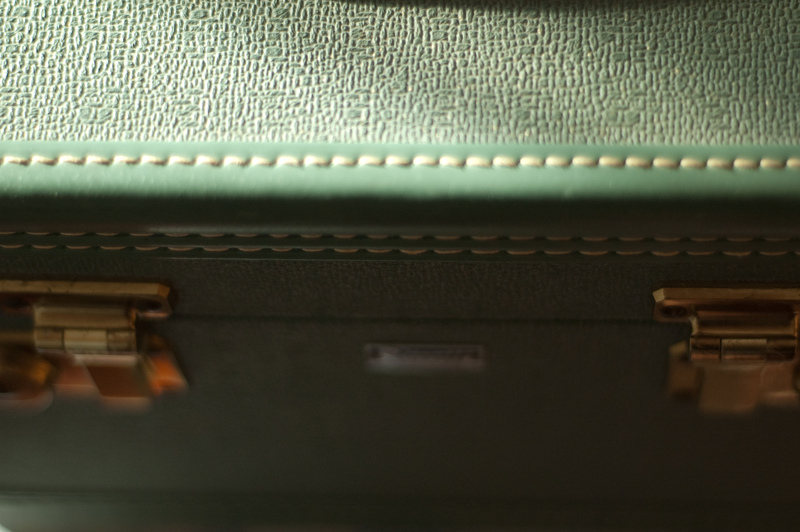 This case will have been filled, not just with belongings but with anticipation. I imagine it belonged to an air hostess, packing it ready for a trip on the Overnight to Dallas. Or a business man’s wife, off to some far away destination (Toronto? New York?) to mingle with the great and good in restaurants and at conferences. I’m not sure what I’ll fill it with, my first thought was to put perfume bottles in it, that seems suitably chic and fitting. But I worry that might change the smell. 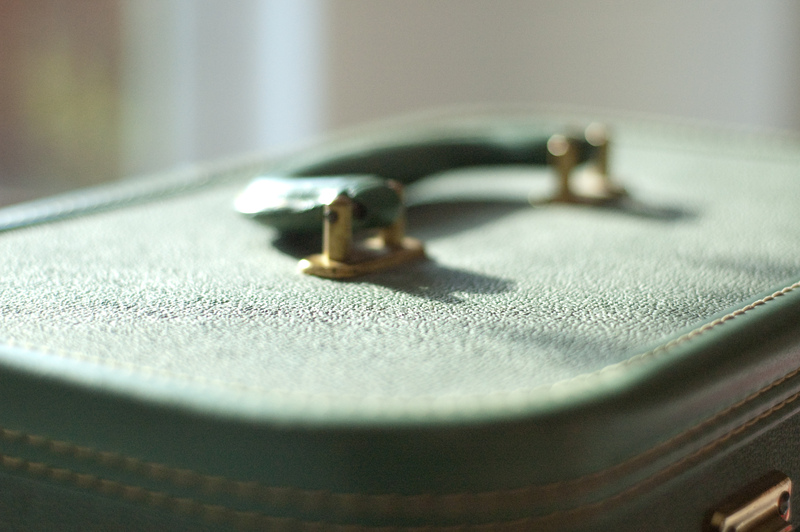 The smell is exactly the same as the case my Mum had, that blissful mix of talc and mildew that speaks of aged feminity. So for now I think I’ll keep it as it is, empty of belongings but full of echoes. Full of what used to be. Emma – I own the same bag and I LOVE LOVE LOVE it! I think I purchased it in a thrift store over 10 years ago for some of the very same reasons. It holds my 1970’s pink foam hair rollers (yes they have been mine since then) along with the brightly coloured scarf my mum used to wrap around my head in case they fell out. It is still one of those cases that I don’t think I will ever par with. Such a treasure, one to keep! Enjoy yours – maybe one day we can compare. Yay for hair rollers and vintage stuff! I am planning on adding to my collection as I am now obsessed. Don’t tell Stephen! Oh, I love it! 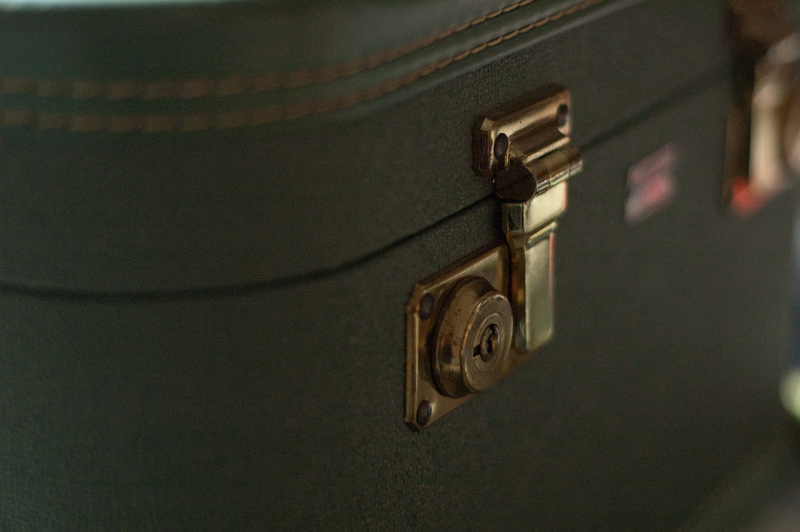 I used to have one when I was a child – I stored all of my treasures in it. And as I got older, I kept notes from boyfriends and trinkets from first dates in it. The smell was perfect! Yay for vanity cases! Everyone needs one. Except for me, I need three. I have one the same color. I purchased it at a thrift store with the idea of converting it to an traveling art box and decoupaging the outside. I got the idea online – can’t remember where now…the poor box has case has been relegated to the top shelf of my craft area as a future to-do project.